How does one get claustrophobia while outside? I never thought it was possible, but I can tell you from experience – it is. While the most common definition talks about closed or small spaces, discomfort by being in a situation that restricts you also applies. With that in mind, let me tell you about a recent afternoon spent with my daughter and her family in Colorado. 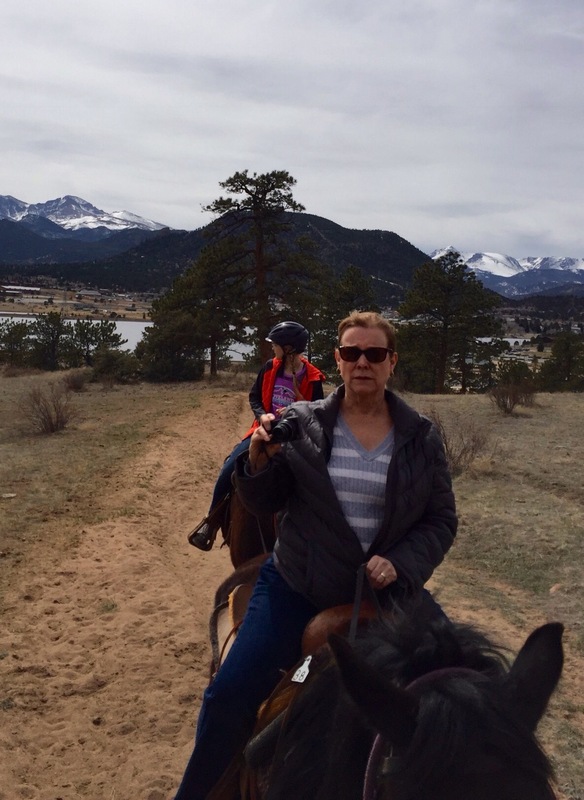 Always the semi-adventurous (if it’s doesn’t put me out of my comfort zone too far) grandmother, I thought an hour-long horseback ride seemed quite doable. After all, I had done this before. Once. In 1995. Obviously 39-year-old Bonnie and 60-year-old Bonnie still have some things in common – but stamina is not on that list. Still, I was confident that I could sit on the back of a horse for an hour. I mean, seriously. It was just going to be sixty minutes. And I didn’t even have to move my feet. I moseyed up to the ranch hand and whispered that my entire horseback riding experience consisted of a ride like this one, and that was ‘pert near twenty years ago. He said that Bertha would be perfect for me. I should have asked perfect in what way, because we weren’t far down the trail when I realized that Bertha had a mind of her own. So perhaps he meant perfect to help me get those arms in shape. Or perfect to keep my attention on the trail since Bertha didn’t seem to want to. Or maybe he meant perfect to give me something to blog about. I don’t know; but I do know that this horse who was supposed to be trained to stay nose to tail with the horse ahead of her, follow a well-worn trail (more like a ditch), and to be so well-behaved that I would barely have to hold on to the reins, obviously had other plans. The ranch hand placed Bertha and me behind my son-in-law in the line-up. The reason being that his horse liked to kick, which well-behaved Bertha would never prompt him to do. Wrong. Bertha did not get that memo and periodically would try to pass him or in one instance gave him a little nibble on the rump. He did not like that, but Bertha was undaunted and even seemed pleased. 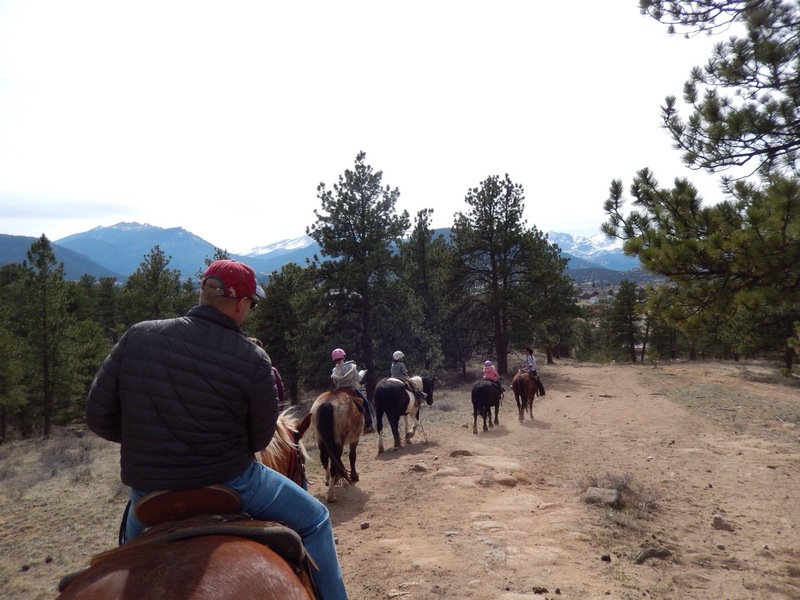 The pungent smell of horse flatulence could not detract from the beautiful views near Estes Park, Colorado. As the feeling was leaving my legs and the rest of my body was (I don’t want to exaggerate here) racked with pain, it dawned on me that our hour must be almost up. A smile came across my face at the thought of walking again. I could do this. I was almost there! My hope was quickly dashed, because at that exact point in time, our trail guide announced that we were at the halfway point. That’s when a claustrophobic feeling took over and I wanted to jump off of the horse. I didn’t, of course, mainly because it was not in my power to do so. It’s a long way down off of a horse, and riding along the mountainside had taken all of my energy and most of my will to live. I remember feeling panicky and wondering how I could feel so boxed in while looking at such grand vistas. I wanted to run but knew my legs wouldn’t work properly, so I toughed it out. My daughter snapped this picture at the moment the trail guide announced we were (only) halfway through our ride. Also at that point in time, my daughter snapped a picture of me. Yes, a picture is worth a thousand words, so I guess I could end this right here. I won’t though, because you are probably dying to know how this story ends. When at last we were nearing the stables, the trail guide told us to pull up to the raised board walk, hold on to the saddle’s horn, and swing our leg over the horse’s head and dismount. Excuse me? Assuming I was able to swing my leg over the horse’s head, there was a 100 percent change I would kick her in the head and then she would ride off with me dangling from her side, laughing all the way (the horse, that is). I had to enlist the aid of my son-in-law to make sure that Bertha and I could go our separate ways amicably. It was a strange sensation being on solid ground again. My body was so mad at me that it just wanted to sit, but I had to tell it no. We would not be sitting again any time soon. First, we had to learn to walk again. There would be plenty of time to sit later. As a side note, I have decided that this will be the last of my every-twenty-year horseback riding trips. I don’t think 80-year-old Bonnie could handle it. Thanks, Leslie. It started out with so much promise! Thanks, Barbara. I wish we lived closer, too. It’s been too long.